This handsome building sits just off of the main road which passes through the middle of this interesting parish. A tall, stately structure built of red brick banded with white and blue bricks, it has windows in the transitional style, and would not look out of place in a busy city centre rather than in this quiet little backwater. East Bergholt, famously, was the home of the artist John Constable, and the building which housed his studio (although I suppose he would have called it his workshop) is in the same lane. There was a Presbyterian society registered in Bergholt in 1672, which built a chapel, and later affiliated to the Suffolk Congregational Union. The baptismal registers here go back to the 1680s. Unfortunately perhaps, the success of the Congregational movement in the second half of the 19th Century motivated the commuinty here to demolish the 17th chapel in 1857 and replace it with this vast space, designed to accomodate 500 people. As you may well imagine, congregations do not anywhere near approach this nowadays, and I wasn't wholly surprised to come across the rather alarming statistic that outgoings on maintenance and upkeep have exceeded income here for more than half a century, the church surviving on the sale of assets and interest from investments. This situation must be repeated again and again across England. 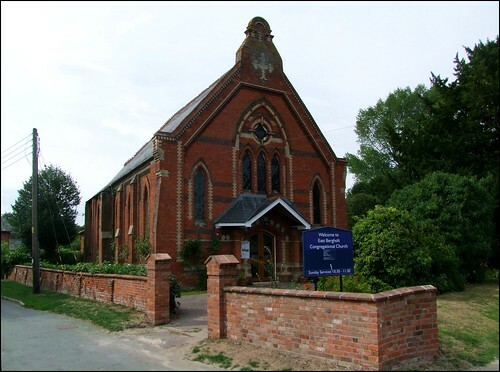 Many Congregational churches came into the new United Reformed Church in the early 1970s, and many of those which did not are still thriving, especially in towns and cities. In rural areas, smaller congregational churches can still find a role, but the days of a huge building like this must surely be numbered - at least, for worship use alone. How good it would be if the people of East Bergholt could find more uses for it, which would be of benefit to the whole community, and incidentally enable the Congregationalists to continue worshipping here.